Most soils in Maryland tend to be acidic. Lime is applied to help bring up the pH. Lawns generally prefer a neutral to slightly acidic soil pH (7.0 to 6.0). Proper pH of soils increase turf grass vigor, improve rooting, and help to improve the turf-grasses ability to absorb nutrients from the soil. If you do not address pH, then this will be a limiting factor as to how healthy your lawn can be. By applying lime to acidic lawns the pH of the soil can be improved over time. Lime penetrates about 1" of soil per year. Thus, it can take years to change the overall pH of your soil. The following chart will help you to understand lime and nutrient uptake. 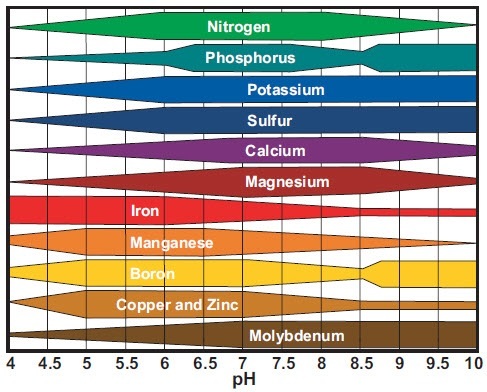 The pH of the soil influences the availability of some plant nutrients and minerals. Also, soil organisms grow best in soils with a neutral pH.